Sufism has existed almost since the beginning of Islam. It is a deeply mystical form. Originally Sufis were ascetics and quietists (i.e. seeking a state of calmness and passivity) rather than mystics, who were driven by an overwhelming sense of sin and dread of the coming judgment day and hell, both vividly portrayed in the quran, to seek a solution in flight from the world." "The name Sufi is derived from the Arabic word for wool and was first applied to a certain Abu Hashim 'Uthman (8th century), whose practice it was to wear a woolen robe. By the middle of the ninth century, the term was applied to all those practicing austerity." The sign of whole-hearted devotion to the mystical life was the woolen robe. 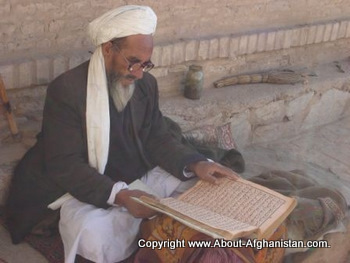 Buddhism having entered Afghanistan early on, has also influenced the development of Sufism within the country. Even though its basic outlook was very different: while a Buddhist seeks moral goodness in himself, the Sufi can become moral only through knowing and loving God." It has its theological roots in the 99 names for God - one of those names for God in Islam is that "God is Loving."